David Cameron has announced an extra £100m for flood works. At Prime Minister’s Questions he pledged £75m for repairs over the next year, £10m for urgent work in Somerset – where several rivers have flooded – and £15m for maintenance. Mr Cameron has chaired his first meeting of the Cobra emergency committee this year to discuss the floods, following widespread criticism of Environment Secretary Owen Paterson’s handling of the crisis. After the meeting he said he would “ensure that everything that can be done to get stricken communities moving is being done: there are no restrictions on help”. On the Somerset Levels, residents of more than 150 homes at Fordgate and Northmoor are being advised to leave their properties as flood defences are in danger of being overwhelmed. Forecasters say there will be an “improving picture” on Wednesday evening. But there will be rain moving up from the south coast on Thursday morning which will spread to south-west England in late morning. About 20-30mm of rain is expected throughout the day. More heavy rain and gales are forecast for Friday night into Saturday. 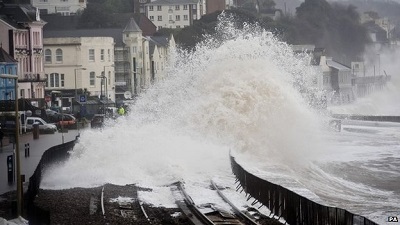 Dawlish resident Robert Parker said the storm was “like the end of the world”. Western Power Distribution said about 44,000 customers had been affected by power cuts since Tuesday afternoon and 9,680 were still without power across the South West. In Cornwall, 7,800 are cut off. The company said around 800 staff were working to restore supplies. Earlier, First Great Western said all lines between Exeter St Davids and Penzance were closed because of the collapsed track at Dawlish and adverse weather conditions. Patrick Hallgate from Network Rail, who assessed the damage at Dawlish, said it could take between four and six weeks to fix the line, which is the main rail link between south Devon and Cornwall. “This is probably the biggest structural engineering feat we’ve faced in the South West for at least the last decade,” he said. First Great Western said some branch lines in Devon and Cornwall were now operating. The Environment Agency has eight severe flood warnings in place, meaning “danger to life”, covering much of the south coast from Cornwall to Dorset and two areas of Somerset. It has also issued about 60 flood warnings and more than 200 flood alerts. The Scottish Environment Protection Agency has issued four flood warnings and several flood alerts. The Met Office It has issued an amber severe weather warning – meaning “be prepared” – for wind for south-west England and south Wales until 19:00 GMT on Wednesday and of rain until 23:00 on Saturday. Firefighters have also been called out to deal with dangerous structures. There have been two incidents in the Tenby area of Pembrokeshire with roofing being blown off buildings. • Why so wet and windy? • How do you stop flooding? • Would river dredging solve floods?